Boo…it has been raining so much – I haven’t even wanted to pee (well outside that is…after an hour long walk outside in the pouring rain I did manage to sneak in some business inside – Mom was NOT happy with me – I’m not quite sure what the big deal is…hadn’t done that in months) – I DO NOT LIKE THE RAIN – Mom puts a coat on me when it is raining a lot – I don’t like the coat – but I really don’t like the rain – so all I think about is when the walk is going to be done so I can get out of the rain and out of the stupid coat. 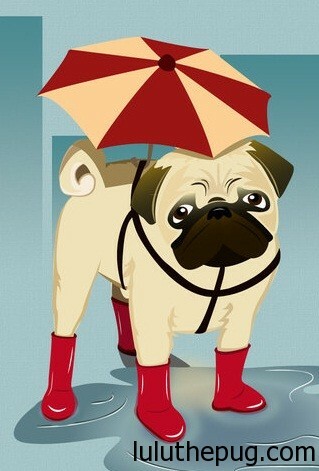 At least she doesn’t put me in boots when it rains like this poor pug (she saves those for when it is -30C). 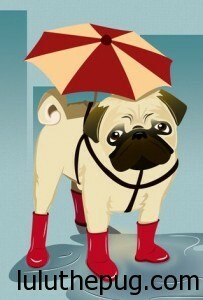 Pugs don’t like the rain and that’s all there is to it! I feel bad that Mommy is mad at me…maybe this cute pug chasing bubbles will cheer her up! We met a nice man who lives on our block while we were on our walk today. He had two dogs with him…and he gave me a treat!! He said it was dehydrated chicken. It was delicious!! Mom never gives me treat while we’re out walking. Later when we were in the park and I was playing a fun game with Mom – and out of nowhere two big dogs came charging at me…I ran off with them – all the way through the park – and ended up in the street. Mom was very upset with me – she didn’t talk to me or look at me for ages when we got home. She usually whispers in my ear before I go to bed – telling me I’m a good dog, and a pretty dog, and she loves me. 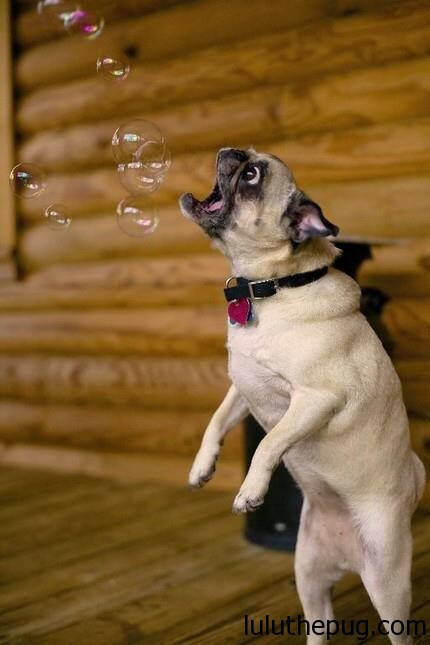 She told me she loves me but she didn’t say any of the other stuff…I must’ve been a bad dog…booo!